Regardless of what ur age might be, I'm sure u've heard of the Woodstock Festival held in 1969 (If u haven't, you ought to be ashamed of urself!....get an education here ). Woodstock was THE Festival of the era. 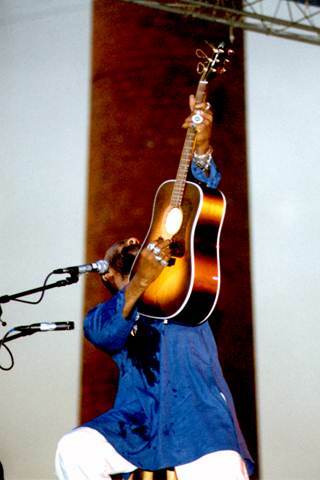 Among the various talented musicians who performed there, Richie Havens, a folk singer was among them. In fact Richie was the man who opened the Woodstock Festival. He performed for about 3 hours or so and among the various songs that he did there, he did one called "Freedom". What makes the song so popular is that Richie wrote it spontaneously on stage. It was a 'modification' of Motherless Child so to say, hence "Freedom/Motherless Child". The song has since then become an anthem of sorts. Since then Richie has come a long way, released many albums and brilliant songs....and continues to do so. Richie has been primararily called an interpretor of other ppls stuff (Beatles, Dylan etc). Personally I find that fine....cause come on ....cover versions are the best form of flattery!.....say what?!! Among the hits that he did have, a notable one was the cover version of "Here comes the sun" by the Beatles. I must say, Richie did a really fine job of that song ( Of course, purists may disagree with that!). In fact all the covers that he does, he does them in a very unique way,- disregarding the original tempo, lyrics , melodies ......adding a new 'touch' to these songs.......makes them 'folkish' so to say..